Instagram is very cool app, but it’s designed only for mobile or web use. But if you seek a solution to download and save Instagram photos on your computer instantly you can try 4K Stogram. It’s free, open source and crossplatform application with minimalistic design. 1. Download and install 4K Stogram. It's available for macOS, Windows and Linux. 2. After the launch of the program, you will see the main window. All you have to do is enter any Instagram username, hashtag or location and click "Subscribe". 4. That's all! 4K Stogram is the easiest solution to grab Instagram photos! 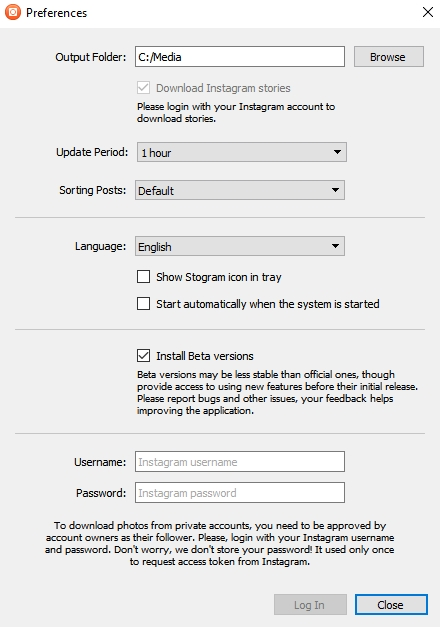 You can add multiple users to follow and new photos will be loaded each time you launch application.